Here are two mini country cat angels. The cat with the blue wings is 1 1/2" wide x 1 3/4" high. The cat face with the checkered wings is 2 1/8" wide x 1 1/4" high. 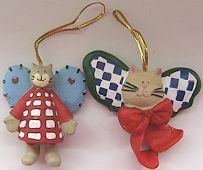 Both ceramic country cat angels are being sold as a set. Previously owned but in good condition. No visible defects.